‘Stowaways held onboard cargo ship’. This story broke just before Christmas and detailed how four stowaways allegedly threatened the crew of a cargo ship with armed bars before being detained by police after an operation to secure the vessel was launched off the Kent coast. Amid the headlines of illegal immigrants and special force helicopters being deployed, though, little mention was made of the seafarers who live and work on the Grande Tema. 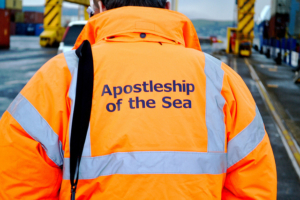 But help was at hand from Apostleship of the Sea. The ship has docked regularly at the port of Tilbury over the years, so a visit on Saturday morning by the Catholic port chaplain, Wojciech Holub, was no surprise given the events of the past days. Wojciech, who works for seafarers’ charity Stella Maris (Apostleship of the Sea), spent time listening to the crew and providing them with data sims so they could contact loved ones. Despite their ordeal, the crew carried on working to berth the ship at the port of Tilbury with the ensuing investigation adding to the toll of this event. Wojciech and a colleague gave the crew Christmas presents and will ensure that when the ship sails the Stella Maris port chaplain in the next port will visit the ship to see how the crew are. Prayers were also offered. Each year Stella Maris (Apostleship of the Sea) visits over 70,000 ships around the world providing welfare services for seafarers; during 2018 they have supported crew of over 70 vessels in trauma situations.